Enter at the bottom of the page for a chance to win the Subbie! The subbie backpack is BOgear’s new entry level backpack. It comes in at AUD$99 (USD$75) which is a great price considering all of the bags features which I’ll get into later in the review. 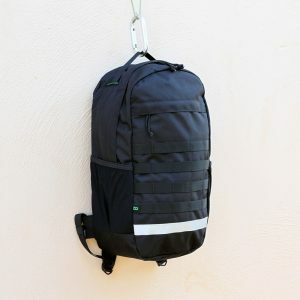 One of biggest changes of this bags design compared to other BOgear bags is that it’s not a full zip panel loading backpack. Because of the two drink bottle pouches on the side the bag only opens around the top half. The Subbie backpack packs several features that are comparable to the Bullpup backpack which I also did a review on. The Subbie retains the reflective strip across the bottom and the molle web strapping. It also is made from a durable, water resistant cordura fabric and includes a covered flap at the top to thread a water bladder straw through. The only things missing from this bag (which the bullpup has) are the velcro patch area, a the lower inside pocket and the pleating from the back sleeve. Of these missing features I only really miss the velcro patch strip. I think it’s a great way to personalise a bag. I really like that this bag is much more lightweight, weighing in at 540g (1.1lbs). The shoulder straps are also a bit thinner than the Bullpup, but still very comfortable and also include extra molle web straps for further customization. The biggest feature of this Subbie bag is the two large water bottle pockets on the side. I personally don’t have much of a use for them myself as my bottle has a carabiner built in and I can clip it to the molle strap. However I am aware many people use and love water bottle pockets. Now onto the negatives of this bag. Instead of water bottle pouches I’d love to have seen an externally accessible laptop sleeve rather then an internal sleeve. The front pocket is still a bit inconvenient to use and I mainly used it for headphones or muesli bars. One other problem I experienced with this bag was the zips would catch on the flap while trying to zip them up. The solution is to just fold it back every time but it’s a little inconvenient, especially if you’re in a rush. Overall this is a good sized, lightweight and affordable bag for one bag travel, hiking or just general everyday use. While its not my perfect bag, its getting very close. 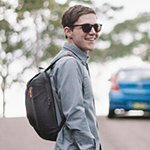 If you’re in the market for a new bag I’d highly recommend checking this one out. Also be sure to enter below for your chance to win this bag in our first giveaway!